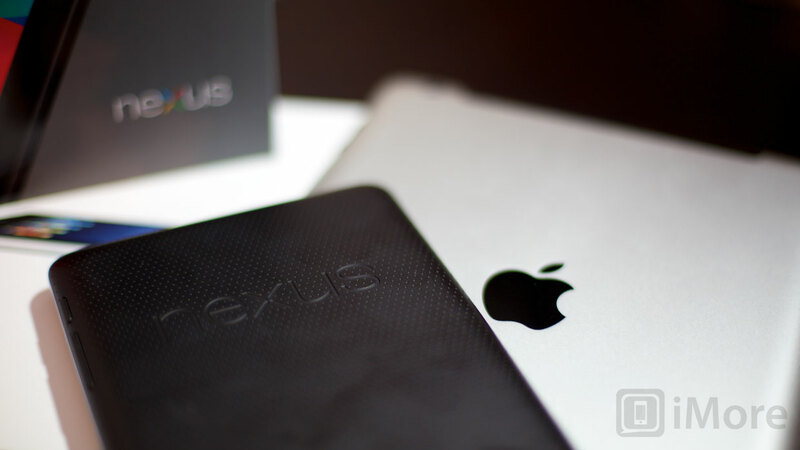 Google Nexus 7 vs. iPad 3, unboxing and first impressions -- from iMore! No, that title isn't a typo! Sure, I'm the editor-in-chief of the #1 site for everything iPhone and iPad, but I've gotten my hands on Google's brand new Nexus 7 tablet, running the all new Android 4.1 Jelly Bean operating system, and I aim to put it head-to-head, tablet-e-tablet against Apple's new iPad. And I'm starting with the traditional unboxing and some quick first impressions. I really like the Nexus 7 so far. The interface on Jelly Bean is, for the most part, gorgeous. It doesn't look at all like iOS, and that's refreshing. It's filled with flat, high contrast colors and lines, and the design language works. Likewise, the animations are much, much better as well, serving more as transitions the way they should, and not delays like they have in the past. The only downside is -- it's not consistent yet. I think Google's decision to allow a mishmash of smartphone and tablet interface elements was the wrong one. 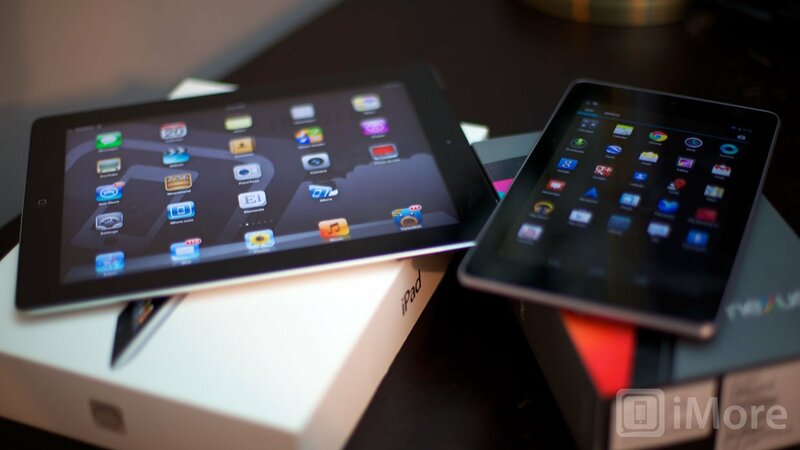 Having beautiful, pixel perfect, tablet-specific apps would make the entire experience better. That feels like a stop-gap, however, and more an issue of time than anything. Matias Duarte is definitely having an impact at Google, but Rome wasn't re-built in a day. The only issue I have with Chrome -- and it's really with Android in general -- is that a) it can't use elastic bounce-back effect that Apple patented, and that really does add to the experience of scrolling, and b) even with "Project Butter", Jelly Bean's simulated physics still feel off, and the touch tracking still feels too loose. For many users this won't be an issue at all. For me, it's like nails on a chalkboard. Android 4.1 is undoubtedly the best, most fluid Android release yet, but slapping on experience polish may simply not be an option. They may need to re-build core parts of the OS from the ground up. My guess is they know that and are already doing it. Unlike iOS, the app launcher isn't the main Home screen, but is available if you want to see all the apps that come with the Nexus 7. I really do miss having a Home button -- I keep trying to hit it on the Nexus 7 only to find it's not there. But what's irking me the most is that, if I put the Nexus 7 to sleep or it goes to sleep on its own, when I wake it up, it often goes to the Home screen instead of restarting where I left it. It doesn't happen when I'm in an app, thankfully, but if I'm in the app launcher, it does. Saved state should be an absolute. I shouldn't go back to the general place where I was when I resume using a device. I should go back to exactly where I was. If I can find a setting to change that, I will. If not, I hope Google fixes that behavior in an update. The small, 7-inch form factor on the Nexus 7 is terrific. It's light, you can hold it by its sides with one hand, and it can easily slip into and out of a jacket pocket. The size does come at a price though. While it's every bit as good for enjoying videos, books, websites, and games, the lack of screen real estate hurts it as a productivity device. I bought a 13-inch MacBook Air over an 11-inch MacBook Air because, even though it's not as ultra-portable, the extra pixels were far more important to me. I live in Coda, Photoshop, and web browsers. I need space. 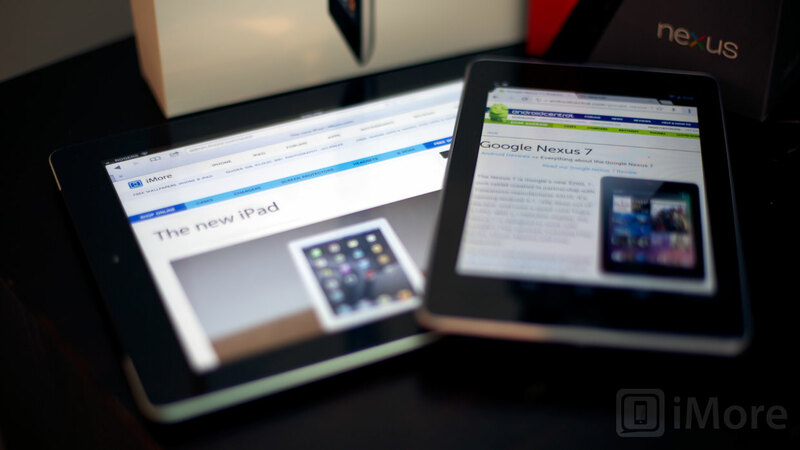 Other people, of course, will value the smaller Nexus 7 more, just like they value the smaller 11-inch MacBook Air more. If I had to line them up, a Nexus 7 is closer to being a bigger, more functional phone where an iPad is closer to a being a smaller, less functional laptop. With a 1280 x 800 display at 216dpi, the Nexus 7 isn't as high resolution or as high density as the iPad's 2048 x 1536 Retina display at 264 dpi, but they're both IPS (in-plane switching) so they both have excellent viewing angles and both look fantastic for everyday use. No one should be disappointed with either of these screens. At times, the Nexus 7 feels like a front end to the Google Play store, much like the Kindle Fire feels like a portal to the Amazon Store, but here I think Google's "openy-ness" will make a big difference here -- Jelly Bean It doesn't feel anywhere nearly as locked in as Amazon's ecosystem. ...Because I don't think the rumored 7.85-inch iPad will be anything like that at all. It will be a small iPad, not a big iPod touch. That will make the iPad mini and the Nexus 7 very different products. And that will make things even better for consumers, and more interesting for those of us who love gadgets in all shapes, sizes, and flavors. Back with more on Monday when I've had a chance to user the Nexus 7, Jelly Bean, and Google Play some more. That's the part I'm most interested in -- and the part where I think the power and flexibility of Android will really shine. Meanwhile, if you're an Android Central expert, feel free to give me your best tips and tricks. I want to get the most out of the Nexus 7!